Animal House. Blues Brothers. Saturday Night Live. A gift for comedy practically unmatched in the history of cinema–John Belushi is one of America’s greatest icons. Belushi died of an overdose at the age of thirty-three, defined by fame, success, and an insatiable hunger for life. This graphic novel offers readers a new perspective on one of the most prominent figures in American comedy, chronicling Belushi's rise and fall and showing how wild success can turn into sudden tragedy. Through a story rich in tenderness and passion, it brings to life the irreverent, excessive, crazy, profane, unpredictable spirit of an actor considered to be the ultimate testament to free thought and nonconformity. Alberto Schiavone was born in Tourin, Italy. Alberto studied art and worked for several years as a bookseller. He now lives in Milan, where he works as a book promoter. 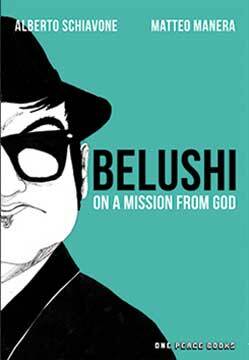 Before Belushi: On a Mission from God, he published three novels. He loves ice wine and looks a lot like John Belushi himself. Matteo Manera was born in Cuneo, Italy, close to Tourin. He is a designer at a communication company. He had worked with numerous Italian magazines before his first graphic novel, published in 2013. He’s such a huge John Belushi fan, Matteo even changed his honeymoon plans in order to visit the Saturday Night Live studio.